Quietly, at the edge of the Coliseum station parking lot, Arroyo Viejo comes out of hiding from beneath Hegenberger Expressway. It runs under the walkway to the Coliseum and joins Lion Creek just short of the bay. Even in its coffinlike culvert, the stream wants to curve, laying a gravelly point bar on its left bank and trying in vain to erode the angle of the culvert’s course into a nice meander. Sorry, old creek. 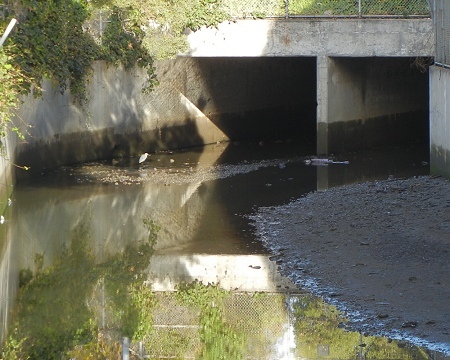 This entry was posted on 13 April 2014 at 9:58 pm and is filed under Oakland streams and water. You can follow any responses to this entry through the RSS 2.0 feed. You can skip to the end and leave a response. Pinging is currently not allowed. Beautiful. Bittersweet, but very beautiful. Wonderful post. Made me sad.